In the United States, the Centers for Disease Control (CDC) recommend certain vaccines. CDC cannot, and do not, mandate vaccines. However, states can and do require their residents to have received certain vaccines on the CDC recommended schedule in order, most notably, for children to enroll in school. All states, however, also offer exemptions from school immunization requirements, and some – like Maine – offer very easy-to-get ones. A bill was proposed by Maine legislator Richard Farnsworth adopting an informed refusal requirement before a parent can make use of Maine’s philosophical exemption to send their child to school without the required immunizations. In response, the Maine Coalition for Vaccine Choice (MCVC), an antivaccine advocacy group, proposed its own law, the “Maine Vaccine Consumer Protection Act.” Proposing an alternative law is not inappropriate. There are, however, two significant problems of the Maine Coalition for Vaccine Choice legislation – the premises underlying the alternative law, and the content of the proposal. The proposal is based on premises that are either simply untrue or inaccurate and misleading. And it’s extremely bad law. None of these claims is correct. Take the second point first–it’s important to note that that lack of trust only applies to a small minority of Maine parents: while Maine has one of the highest rate of exemptions in the nation, and that rate has gone up in 2013-2014, it has gone up to 5.2% non-medical exemptions–796 children out of Maine’s kindergarten population. A fraction of that small minority is represented by MCCV. While tiny, MCCV is vocal and passionate. Vocal and passionate is not the same as correct. It is important to point out the problems with MCCV’s claims and their proposed legislation. Taken together, they have the potential potential of their proposals to mislead Maine parents into leaving more children unvaccinated, further undermining the herd immunity that currently protects everyone, and especially the children left unvaccinated. The proposal starts by stating that the choice of the National Childhood Vaccine Injury Compensation Act of 1986 to create a no-fault program to handle vaccine injury claims led to corruption in the system. The claim is based on a series of unfounded, problematic propositions. To start with, it’s inaccurate that the act, “removed the rights of individuals to sue in cases of vaccine injury and death, and closed the courthouse doors to families with vaccine injured families. [sic].” This is an entirely false claim. 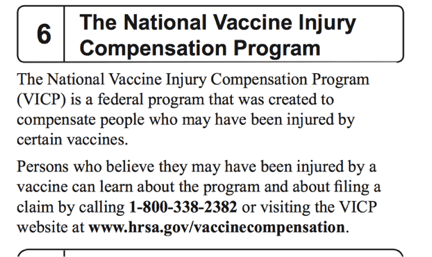 There is a compensation program available to the parents – the National Vaccine Injury Compensation Program, NVICP. This program offers substantial benefits to those who believe that they, or their children, have suffered injuries from vaccines. These benefits include: coverage of attorneys’ fees for all cases (not just those successful); reduced causation requirements; no need to show fault; and relaxed rules of evidence. Appeals against NVICP’s decisions can be brought to the Court of Federal Claims and from there to a federal circuit (and from there to the Supreme Court). This is hardly a case of “closing the courthouse door to families”. There is a shadow of truth to the claim that the rights of individuals to sue in cases of vaccine injury and death were reduced. The 2011 Supreme Court decision in Bruesewitz v. Wyeth (pdf) means that families cannot sue in state courts if they are unhappy with NVICP’s resolution of their design defect claims. But they still have the appeal process described above, and they can turn to the state courts with manufacturing or warning defect claims. It is important to note that providing an easier claim process as a first step, as the NVCIP does, is hardly a wrong against those families. All three phases are heavily regulated by US and other national agencies. There are further steps. The vaccine under consideration for approval then needs to be approved by a special advisory committee within the FDA . Once approved, the vaccine is subject to several mechanisms of post-market monitoring by both the CDC and the FDA. The FDA has the authority to fine manufacturers for violations of regulations or take other actions. And if problems arise, a vaccine can be taken off the schedule and off the market. After this extensive licensing process, in order to add a vaccine to the recommended schedule it must then go through a process that includes review by the Advisory Committee of Immunization Practices in the CDC and recommendations from the American Academy of Pediatrics and the American Academy of Family Physicians. At that point, it is still not part of a state’s school immunization requirements: to do that, depending on the state, the legislature has to change a statute or the health department rules – another deliberative, regulated process. Should a possible problem arise with a recommended vaccine, it can be reviewed again by the same bodies that performed the initial review and the recommendation rescinded. In fact, the process to bring a new vaccine to market is quite complex–detailed information on it is freely available for inspection (pdf). To claim the vaccine program does not have legal accountability is to ignore the multiple legal mechanisms designed to make sure it is carefully monitored and supervised. 1. More vaccine doses were added to the schedule since the creation of the act. First, suggesting that it was the creation of NVICP that led to more vaccine being created – rather than to technological advances and creative action by scientists – is unsupported by any evidence. Second, given that the evidence is that the schedule is very safe, as supported by (pdf) independent publications, what is the MCVC’s problem with protecting children from more diseases? 2. NVICP rejects the vast majority of claims made by families. While this statement is true on its face, the context shows that it is misleading. A quick look at the program’s statistics will show that most claims do, in fact, lose. As of January 7, 2015, in its 25 years, the program compensated 3540 claims out of 13,274 filed, a rate of a little under 27%. First, without the large scale Autism Omnibus Proceeding – over 5000 cases in which parents claimed their children’s autism was caused by vaccines, a claim rejected on the basis of extensive scientific evidence–the rate of winning claims would be much higher. Second, let’s consider this rate in context–compare it to the rate of wins in product liability cases, which stands around, or a little less than, 20%. And that includes the easier manufacturing defect claims (most vaccine injury claims are design defect claims), which win at higher rates. In other words, families fare better in NVICP than in the courts. Furthermore, even administrative programs require meeting basic eligibility requirements, in this case, showing a connection between the alleged harm and a vaccine. If a claim cannot meet even the program’s lax causation standards–as was the case for the claims that vaccines cause autism–the program is supposed to reject it. This claim is simply incorrect. The program is financed by an excise tax on each vaccine that is paid by the manufacturers. So no, it’s not the states and families who pay. It’s the manufacturers. Ironically, the proposed law would shift some burden for the process to the State of Maine by creating an unneeded bureaucracy in the form of a vaccine injury office. With respect to the claim about adjudicating vaccine injuries, while DHHS has a role in making an initial recommendation about cases, and deciding whether to concede them, it does not adjudicate them. The NVICP’s special masters–who are appointed by, and part of, the United States Court of Federal Claims (USCFC)–do that, subject to review by USCFC’s judges and the circuit courts. In other words, the adjudicative body is separate from DHHS–no conflict of interest there. In the next passage, MCVC alleges that there is a cascade of corruption in the CDC and the NVICP, having to do with safety and efficacy of vaccines. None of these claims actually demonstrate corruption in either body. There is no such Congressional investigation going on; and outside the small anti-vaccine groups, no one sees this as a scandal. In fact, there is no credible evidence that anything in the article attacked actually supported a link between vaccines and autism, and there is no real evidence of wrongdoing by the CDC researchers. Yes, the Department of Justice did indict Poul Thorsen, a former CDC official, on a number of counts of financial malfeasance. However, the Thorsen indictment shows that an individual researcher – one who was not a lead author on any paper about vaccines and autism – possibly committed personal embezzlement against the CDC. The CDC is the wronged party in this story. It does not show corruption by the CDC. Nor is there any evidence of research fraud in any of the papers Thorsen collaborated on. Two scientists formerly employed by Merck have claimed that Merck falsified mumps vaccine effectiveness data. Fact-finding has not commenced in this suit. There is reason to doubt the scientists’ claims, though the facts are not yet clear. The suit itself is not evidence of wrongdoing by the CDC, the FDA, or NVICP, nor is it evidence of any safety problem with any vaccine. An anti-vaccine activist who is a co-founder of MCVC claimed, on her personal blog, that the program director, Cassandra Grantham, of an organization that is a coalition of Maine healthcare providers made misleading claims about vaccine safety. Ms Grantham responded, disagreeing with the blogger. With all due respect to the blogger’s opinion, the fact that a private actor made what she considers incorrect statements is not evidence of corruption in the CDC, NVICP, or anywhere else in the policy-making system. The GAO report about NVICP did not find “failures of the NVICP to properly compensate families of vaccine victims.” It found a system that is not perfect, but did not describe systematic failures or criticize it harshly. It also highlighted the efforts the system constantly makes to improve. And it certainly did not find corruption. While the AP report, as described in several news articles, was more critical, it placed the blame for many of the problems on petitioners’ lawyers and their behavior that led to delays–and the news articles, at least, had several serious inaccuracies. The research alleging that the NVICP has been paying cases of autism is based on a law review article that looked at 83 cases – none of which was compensated for autism, and some of which were clearly compensated for other things, including seizure disorder. As evidence that vaccines cause autism, it has been justly criticized. In short, the proposal is based on a list of untenable, inaccurate claims. Not only is the proposed law based on a set of inaccurate, untrue claims, it is, itself, very bad policy. Let’s examine each part. The NVICP table is not a good source for teaching doctors about vaccine injuries. First, it was never designed to be an exhaustive list: even in NVICP, claims can be brought outside the table. If doctors focused on it, they would be missing other possible injuries. Second, the table itself is far from perfect: it’s both under and over inclusive because it requires an administrative rulemaking process to change–and not only are those processes notoriously slow, someone has to initiate them. The table is under inclusive: it may not include injuries that science shows are caused by vaccines–if the DHHS did not act to add an injury to the table, that injury will not be on it. The table is also over inclusive: for several injuries that were originally included on the table, scientific evidence accumulated that such injuries are not, in fact, caused by vaccines. One example is the whole-cell pertussis vaccine causing brain damage. At the time the VICP was created, the scientific consensus that brain damage was a rare side effect of receiving the whole-cell pertussis vaccine. Later studies showed that the pertussis containing vaccines do not cause brain damage. Summary of these large-scale studies – with references – can be found in Dr. Paul Offit’s book, Deadly Choices, pp. 29-32 and footnote 31. A second example is the alleged connection between receipt of the measles vaccine and encephalitis. At the time the VICP was created, it was thought that there was such a connection, although there was never strong evidence for the claim. Recent studies suggest that there is no connection between receipt of the measles vaccine and the subsequent development of encephalitis. In spite of the new evidence, the table still includes both injuries. That is because updating the table requires an affirmative act and devotion of resources by an agency that may have many other priorities; and even in the best of cases, it would take time. Why require doctors to follow a bureaucratic document created for a specific legal purpose rather than the scientific and medical literature? This element of the MCVC’s proposal assumes that doctors are unable to diagnose vaccine adverse events. 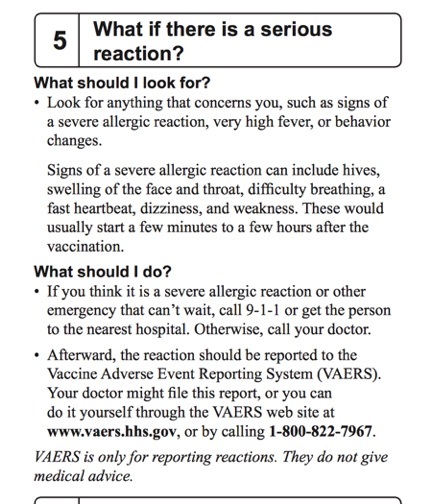 But there is no reason to assume that a doctor cannot identify an allergic reaction, a febrile seizure, or other problems that vaccines may cause. Fatalities from motor vehicle accidents or suicide are obviously not caused by the vaccine. Giving the list of harms reported in the inserts to patients (or in the case of juvenile patients, their parents) is simply misleading them as to what, in fact, are the risks of the vaccine, because the insert inevitably includes things not caused by the vaccine. Giving patients or parents information from VICP cases also is problematic. Most importantly, court decisions are not scientific evidence. Some decisions may well not reflect what we know about causation. Take, for example, Koston v. Sec’y, Dep’t of Health & Human Servs., 974 F.2d 157, 161 (Fed. Cir. 1992). The child in the case was diagnosed with Rett Syndrome and compensated. On appeal, the court upheld the compensation on the basis that Rett Syndrome is of “idiopathic origin”, because a genetic cause is not known. That was true in 1992, when the case was decided–the genetic basis was discovered in 1999. So should the Maine VIS include a court decision that we today know was in error, and tell parents that a genetic disorder is caused by vaccines (presumably, the vaccine reached back in time and changed the fetus’ genes before birth)? Why mislead parents this way? The list of risks in the federal VIS is much more accurate. So why waste resources on a duplicate? And one that’s misleading? If the law’s only purpose is to scare parents from vaccinating by misrepresenting vaccine risks, that’s not a legitimate goal. Parents deserve better than to be deliberately misinformed about vaccine risks. This part of MCVC’s proposal presupposes that there is a large population in Maine suffering from vaccine injury, who need support from the state. The entire population of Maine is approximately 1,328,000 people. How many of those will suffer a vaccine injury? Maine’s population comprises 0.4% of the total US population. Currently, according to the most recent data from VICP, for every million doses of influenza vaccine distributed, 0.99 vaccine injury cases are awarded. Assuming that every award does in fact reflect an injury caused by a vaccine–and since most of these are settlements in which causation was not established, that’s a troublesome assumption–and assuming every person in Maine received an influenza vaccine every year between 2006 and 2013, a total of 4 Maine residents would have had an injury from the influenza vaccine. The purpose of this new office is apparently to evaluate vaccine injury claims and provide referrals to doctors and attorneys. It would also serve as a place for parents to complain, apparently, if they think someone made a false vaccine safety and efficacy claim. People who are injured by vaccines do have recourse through the VICP. It is somewhat difficult for a lay person to navigate, but there is a robust segment of the legal profession who specialize in vaccine injury cases, and can help their clients navigate the process. And as a reminder to readers, VICP covers legal fees and costs – including the costs of experts. The MCVC has not shown a need for a new and resource-consuming administrative body to provide support for the allegedly vaccine-injured. Further, to be blunt, such an office is unlikely to get the promoters of the proposal what they want. For example, imagine a parent who believes her child’s autism was caused by the vaccines. If one of the functions of the office in question is to evaluate claims, it would tell someone like that, based on the best scientific evidence, “sorry, autism is not a vaccine injury, as determined by numerous scientific studies. Your claim is invalid.” The office would not help those claiming that an injury was caused by a vaccine against the evidence. In short, the premises behind the proposal are inaccurate; the proposal itself is redundant at best and has the potential to mislead parents at worse, and even the parts that may be justified are resource consuming – and the authors have not made a case that the expense is justified.